All Day Comfort: Work in comfort with a stable, sculpted trackball that supports your hand and lets you rest your arm. Small Wonder: Logitech Unifying receiver the tiny, wireless receiver that stays in your laptop and lets you add compatible devices as you need them. Logitech Unifying Technology: Easily connect up to six compatible wireless devices keyboards, number pads or mice without the hassle of multiple receivers filling up your USB ports. Super Powered: With up to 18 months of use from a single AA, you might just forget your trackball uses batteries at all. A Different Kind Of Comfort And Control: You’ve got a different kind of comfort thanks to a leave-in wireless receiver, long battery life and precise cursor control that lets you work and play wherever you want. Compact Footprint: Short on space? No problem. Because the trackball doesn’t move, it’s perfect for tight workspaces and busy desks. Time Tested Shape: Millions of people have loved the Logitech Trackman Wheel. We’ve refined its proven shape to create the M570. Logitech Advanced 2.4 GHz Wireless: You get the reliability of a cord with cordless convenience and freedom - fast data transmission and virtually no delays or dropouts..
Wireless Freedom: Who wants a cord in the way? The robust wireless connection lets you control your laptop, desktop computer of home theater PC from up to 30 feet (10 meters) away. Tiny Wireless Receiver: It’s so small it can stay plugged in a USB port. You don’t have to unplug it when you move around or worry about losing it. And your trackball is always ready to use. Storable Receiver: If you do need to remove the tiny receiver, just tuck it away right next to the battery. 18 Month Battery Life: The long battery life virtually eliminates the hassle of changing batteries. The On/Off button saves power, while an indicator light helps you avoid surprises. Work and Play Anywhere: You get precise cursor control wherever you want to use your trackball. Hard tables, comfy sofas and lumpy beds are all no problem for the M570. Adjustable Speed: The M570 now sports an adjustable laser sensor, giving you a wider range of cursor speeds and the perfect amount of control. Scroll Wheel: You can easily move up and down through Web pages and long documents. Programmable Buttons: You can customize your trackball’s buttons to help you do what you want faster. Back/Forward Buttons: Moving quickly between documents or browsing your favorite Web sites is a breeze with large, easy to reach Back or Forward buttons. Easy To Clean: Should you need to clean your trackball, removing the ball is a snap. Easy To Move: Your desk, your comfy chair, your bed this trackball is easy to take with you around the home. The ball even stays in place when you turn it upside down. Question: Does this mouse come in a left handed version? 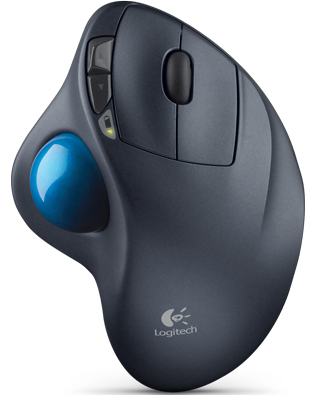 Answer: The Logitech M570 trackball mouse you have asked about does not come in a left-handed version. However, we do have other Logitech track ball mice that are ambidextrous. Please take a look at our Logitech 910-000806. We also have a mouse that is specifically designed for users who are left handed- Evoluent VM4L. 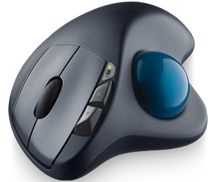 Although this does not have a track ball, it does have a scroll wheel and was voted PC Magazine Editor’s mouse of choice.